The Aspen Bedside Chest is made from America's richest hardwood, hand-finished and built by genuine Amish craftsmen, with skill that is only passed down from one generation to the next. The pullout surface under the top is a small detail that will make this nightstand enjoyable to use in your master bedroom. Walnut inlays and shaped sides add the the unique flair with a blend of Arts & Crafts and contemporary style. This item is available in your choice of six wood types. 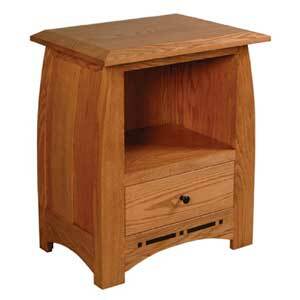 Choose from red oak, white oak, soft maple, hard maple, cherry, hickory and walnut. 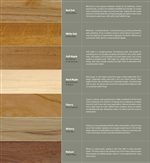 A large variety finishes add up to over 75 wood and finish combinations so you can create the exact look you dreamed about for your home. Nightstands with opening: You may order these with the opening in the top (standard) or bottom, please specify if you want it on the bottom. 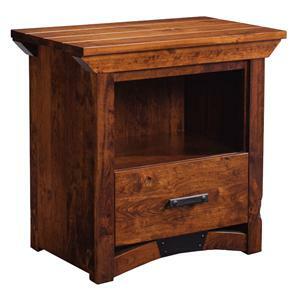 The Aspen Bedside Chest with Pullout Surface by Simply Amish at Mueller Furniture in the Lake St. Louis, Wentzville, O'Fallon, MO, St.Charles, St.Louis Area, MO Furniture Store and Belleville, Shiloh, O'Fallon,IL area. Product availability may vary. Contact us for the most current availability on this product. 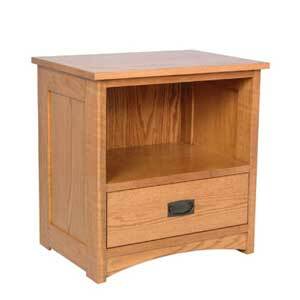 Finish Your choice of handrubbed finish applied using multiple steps for durability. All items are sanded and multiple steps as well as tested to be smooth to the touch. You never know what some drip will drop. That’s why we protect all of our furniture with a sealant that makes it practically impervious to water, nail polish remover and alcohol. Of course, being Amish, we are just guessing on the last two. Finish & Paint Options If you like options, you’ll love us. In all, we offer more than 75 combinations of woods and stains, along with additional treatments like distressing and rubbing, which helps to create the subtle look of a family treasure gently worn by time. 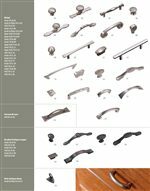 Handles & Hardware Standard with Wood Knobs (WK-A-05). 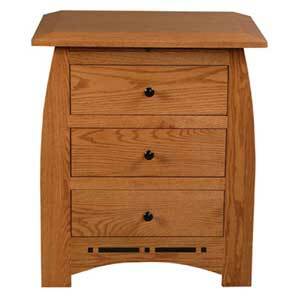 Drawer pulls and other elements provide the finishing touch to your Simply Amish selection. Most of our furniture is available in your choice of hardware options, although some may require a slight additional upcharge. 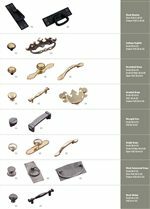 Styles include nickel, brass, copper, iron, wood, or porcelain. Burnished, brushed, polished, hammered, blackened or weathered. Drawer / Shelf Construction Solid, hand-finished drawers with dovetail joints in both the front and back, designed to keep their shape for generations. 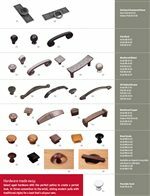 Drawer Suspension Exceptional drawers require exceptional hardware. That’s why our drawers feature heavy-duty slides that are fully enclosed and mounted from below, combining years of quiet, reliable operation with an unobstructed view of their solid dovetail construction. SmartSlides. Based on the same high-grade hardware found in our standard slides, SmartSlides fully extend for maximum access and feature an advanced mechanism that prevents slamming by self-closing each drawer inches from the cabinet. Select items come standard with SmartSlides. For a small upcharge, they can also be added to any drawer. 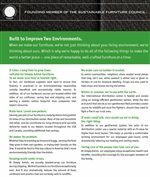 Completely concealed, heavy duty, and dependable. Smartslides fully extend to view everything in a drawer and include a concealed spring-loaded system that allows the drawer to easily self-close 1-1 ¼” from the cabinet. Case Construction At Simply Amish, we only use northern, slow-growth hardwood, chosen for the greater density typical of wood grown in colder climates. Grown and harvested in the USA, the use of these beautiful hardwoods helps support the local economy without adding to the problem of rainforest depletion. 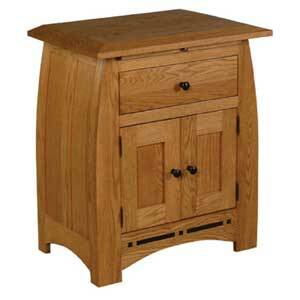 Choose from red oak, white oak, soft maple, hard maple, cherry, hickory and walnut. The trees raised to the perfect age, and wood is slowly kiln-dried to prevent splitting and provide years of solid use. 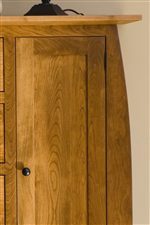 There are some cases where solid wood panels aren’t practical, simply because the seasonal contraction and expansion would destroy the integrity of the joints. In these cases, we still use hardwood — just in a plywood form, layering multiple panels in a cross-grain build for maximum structural stability. This wood is most typically used in shelves, cabinet backs, and on cabinet sides without a flat or raised panel. Warranty Our promise is simple. If your furniture fails during normal use in the lifetime of the original owner due to problems in either the workmanship or material, we'll repair or replace it for free, with the following exceptions: Cabinet lights, as well as all finishes, fabrics and leather* are warrantied for one year; the moving parts in our desk chairs and recliners are warrantied for three years; and, while we fully appreciate the beauty of unfinished furniture, we are unable to extend our warranty to any furniture that’s not protected by our exceptional finish. *Does not apply to damage caused by others or any defects resulting from abuse, alterations or accidents. In the rare event that your furniture becomes damaged or needs to be repaired, we’ll return it to its original maker, to be restored to the way it looked the day it left his shop. Curve appeal. Our beautiful Aspen line creates a bold twist on traditional mission design, resulting in casual charm with just a hint of contemporary artistic flair. Broad lines melt into dramatic curves, while ebony inlays add a dash of color and style. The traditional Aspen collection is also available with optional maple knobs and inlays. 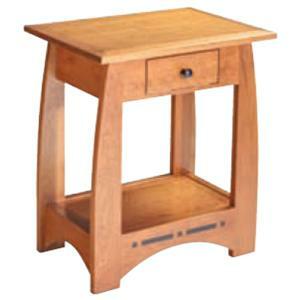 You benefit from the time honored, quality Amish hand craftsmanship of each piece. 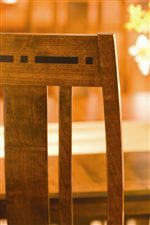 The tradition of heirloom quality means that each handmade piece of furniture is signed by the craftsman himself as any artist would. Complete your mountain manor with the dining pieces. The dark inlays and deep curves of the Aspen Collection shine in this distinctive dining room set for formal or everyday dining, along with the dining storage pieces you will have everything you need to turn the simplest dinner into a great night in. For other rooms in your home, you'll find desks for your home office, a sofa, loveseat, TV stands, living room accent tables, rocking chairs, and hall benches. 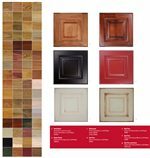 For your convenience, many of our most popular selections are available in select woods and stains, ready for immediate shipment. Amish isn’t a style. It’s a standard of excellence — desired by many and practiced by a very rare few. 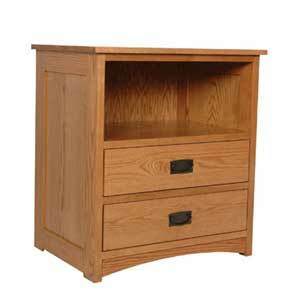 It’s in the fine details of solid hardwood drawers, finished inside and out to protect delicate clothing from damage. It’s in the skill of genuine Amish craftsmen, faithfully passed down from one generation to the next. 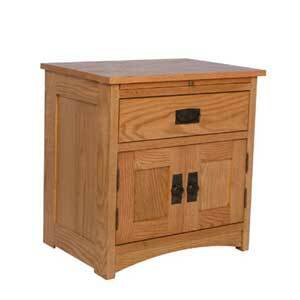 But most of all, it’s in the beauty of America’s richest hardwoods, handcrafted in a thousand different styles. The options are endless. The choice is yours. Choose from six wood types, including red oak, white oak, soft maple, hard maple, cherry, hickory and walnut. With more than 75 combinations of woods and stains, it’s easy to create different looks with the same piece of furniture. Try a two-tone finish. Apply a color varnish. Or use contemporary hardware on traditional furniture to give it a bold new twist. The Aspen collection is a great option if you are looking for Mission furniture in the Lake St. Louis, Wentzville, O'Fallon, MO, St.Charles, St.Louis Area, MO Furniture Store and Belleville, Shiloh, O'Fallon,IL area. Durable walnut inlays are cut from strips of quality wood not paint to simulate the look of inlaid wood, like some manufacturers. Standard with Black Knob Hardware. Custom Hardware Options Available. Browse other items in the Aspen collection from Mueller Furniture in the Lake St. Louis, Wentzville, O'Fallon, MO, St.Charles, St.Louis Area, MO Furniture Store and Belleville, Shiloh, O'Fallon,IL area.